A person in Richmond showed off an unusual mode of transportation in the snow on Sunday. 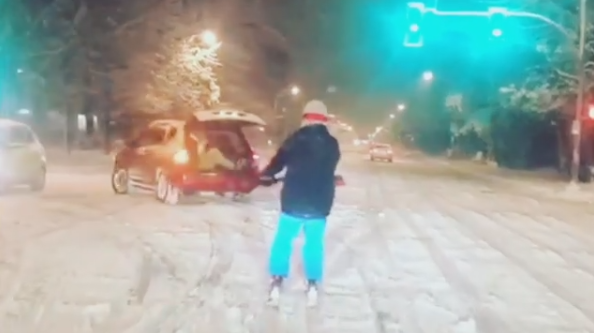 Video posted to Instagram shows a person on skis being towed behind an SUV on Gilbert Road and Granville Avenue around 9:45 p.m.
Richmond RCMP have confirmed they're looking to see whether any action was taken against the driver, and emphasized the stunts should be kept off the road. "We like snow as well. However, when it comes to safety, we are sticklers. Save skiing for the slopes and support our local ski resorts and operators," said Cpl. Dennis Hwang in a statement to CTV Vancouver. It follows a pattern of reckless weather behaviour in Richmond. Mounties issued a warning Monday about clearing snow off cars "for safety's sake," after a snow-covered vehicle was spotted at 10 a.m. at No. 3 Road and Westminster Highway. Richmond is expected to see up to 15 cm of snow Monday evening through Tuesday.